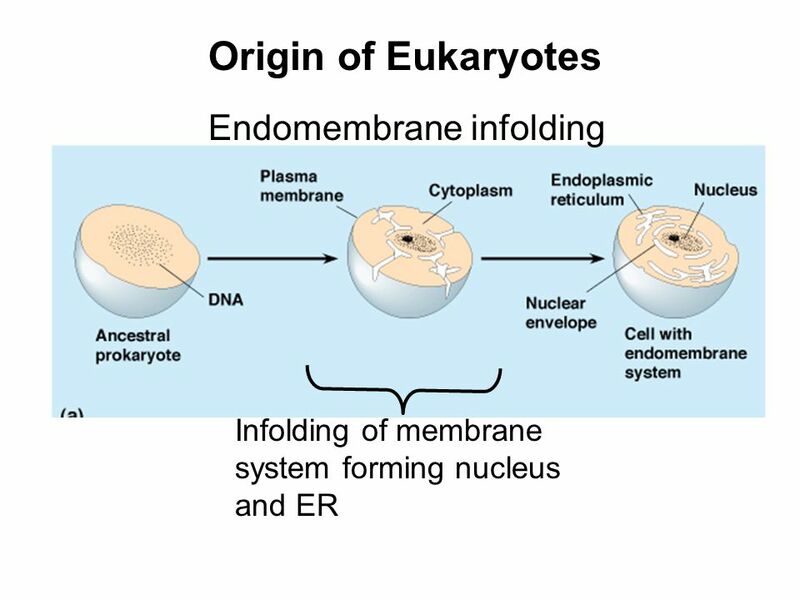 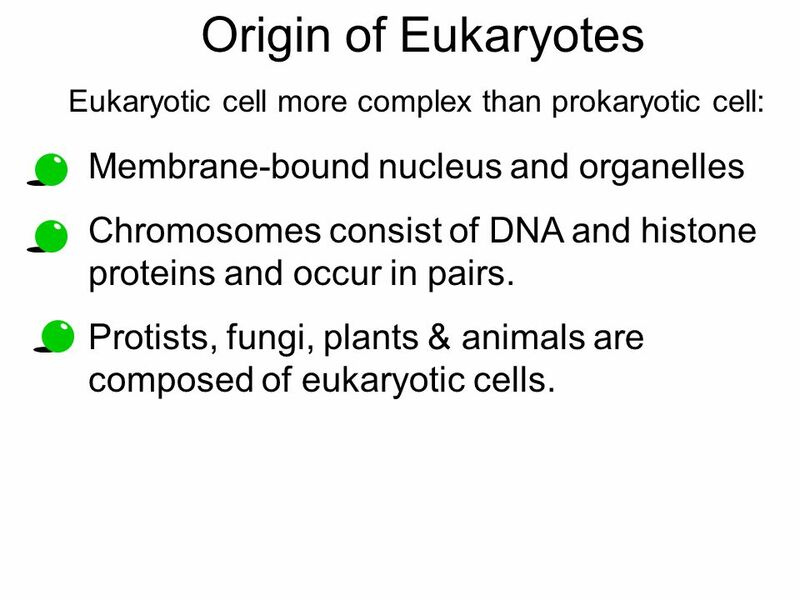 Eukaryotic cell more complex than prokaryotic cell: Membrane-bound nucleus and organelles Chromosomes consist of DNA and histone proteins and occur in pairs. 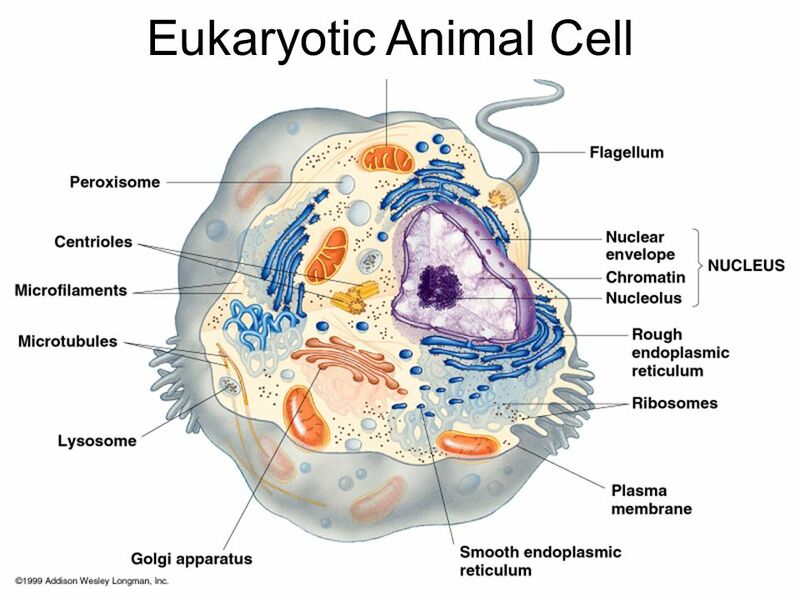 Protists, fungi, plants & animals are composed of eukaryotic cells. 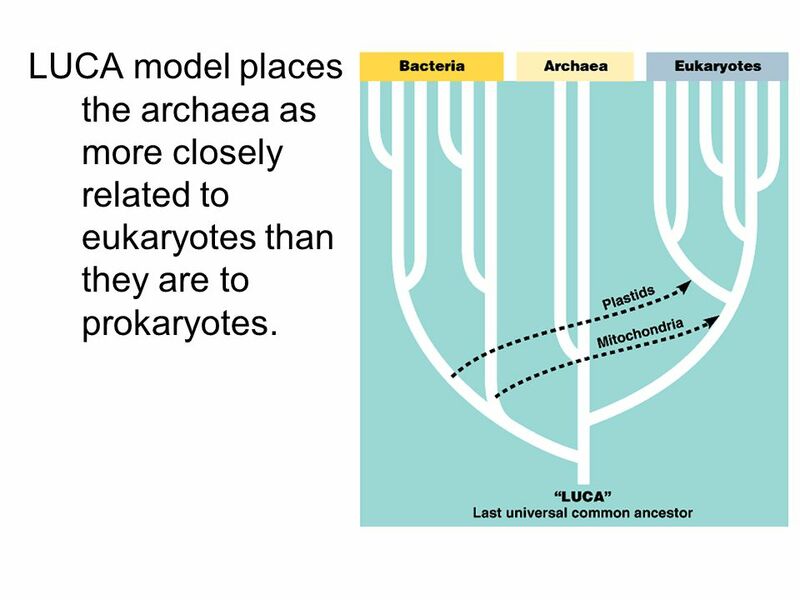 17 LUCA model places the archaea as more closely related to eukaryotes than they are to prokaryotes. 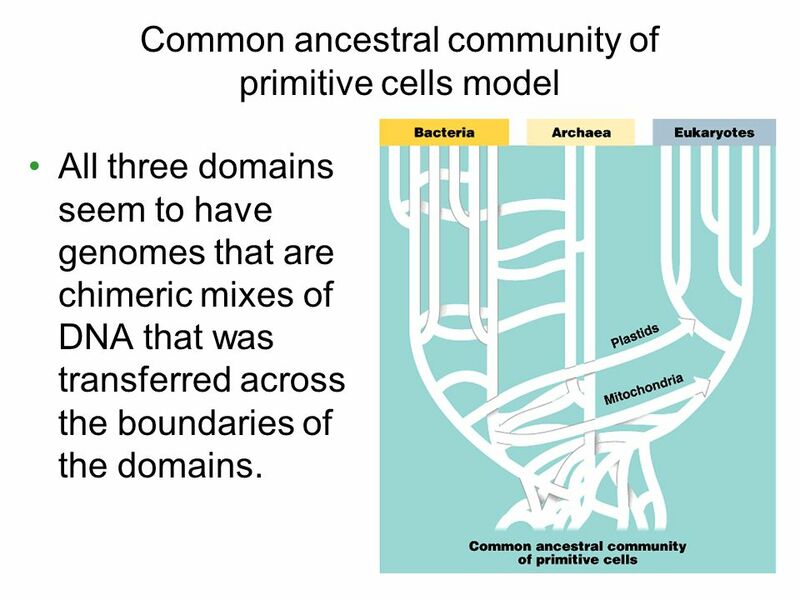 All three domains seem to have genomes that are chimeric mixes of DNA that was transferred across the boundaries of the domains. 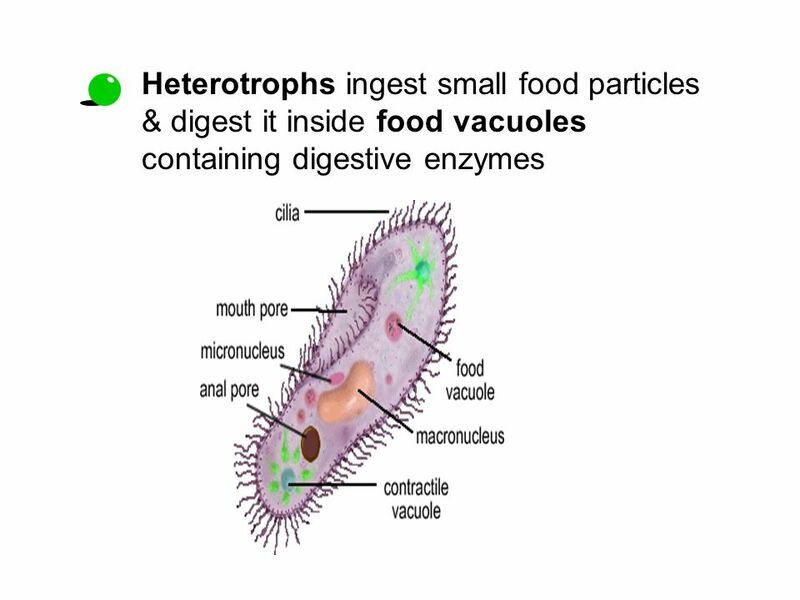 28 Heterotrophs ingest small food particles & digest it inside food vacuoles containing digestive enzymes Paramecium consume nutrients from other organisms. 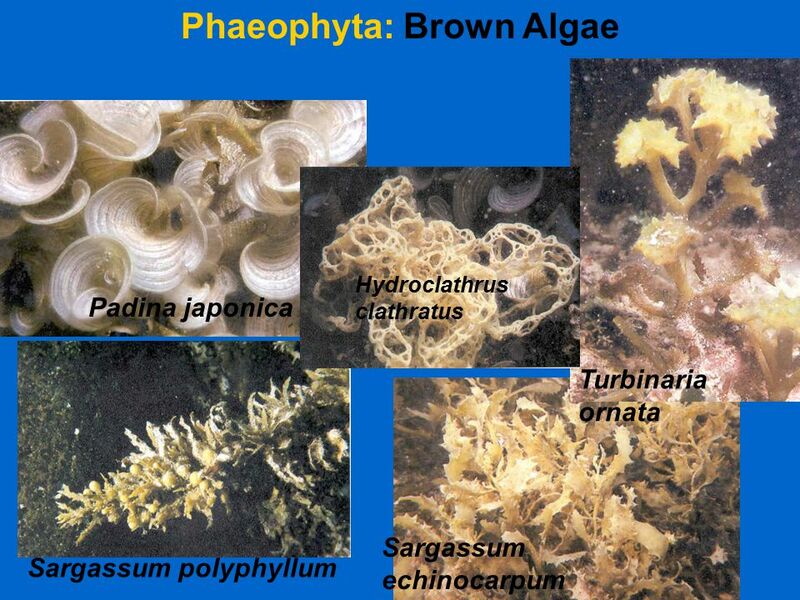 Their diet is bacteria, algae, yeast and other micro-organisms. 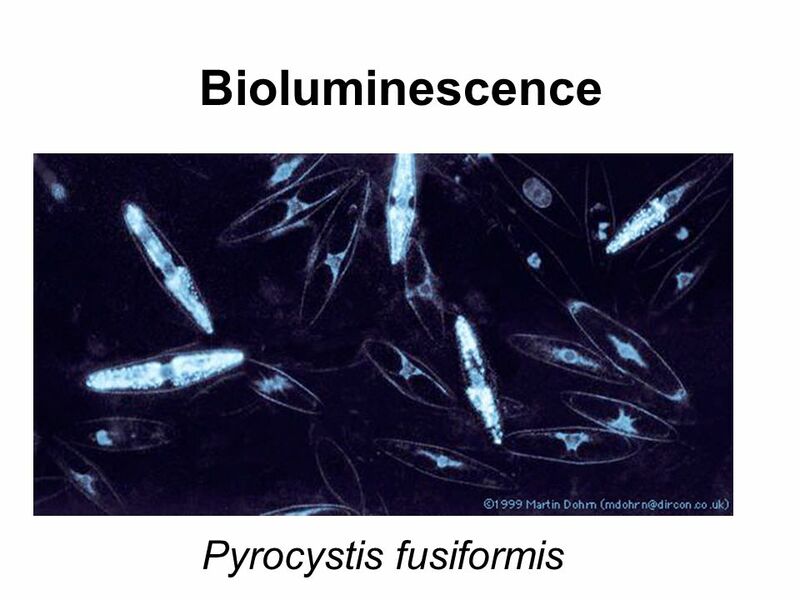 It uses its cilia (strand or tail) and consumes the substance along with water from the mouth of the paramecium. 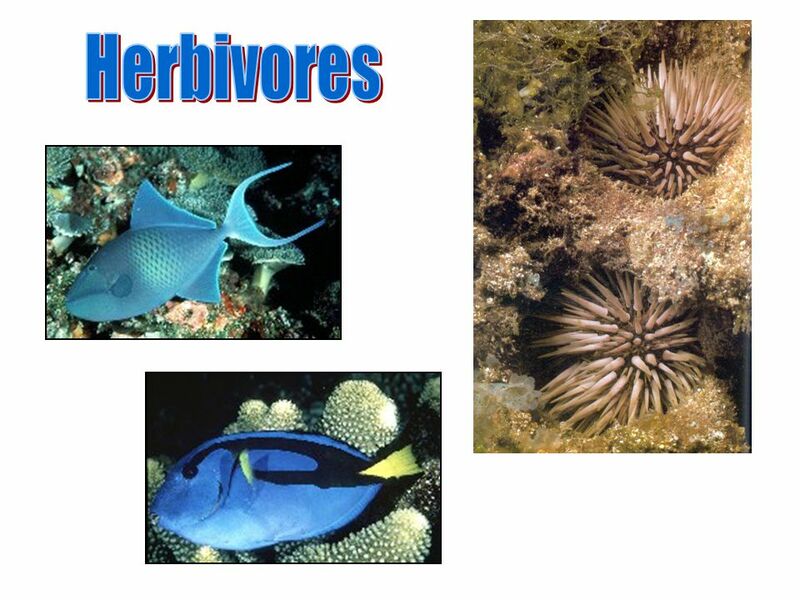 The food enters the gullet or stomach and is stored there. 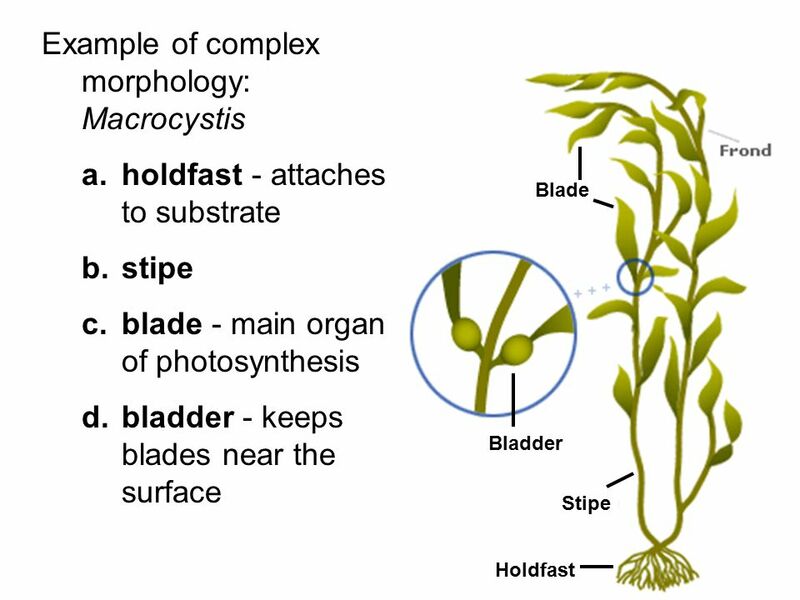 After the gullet is full, the food breaks away and creates a vacuole along with the water. 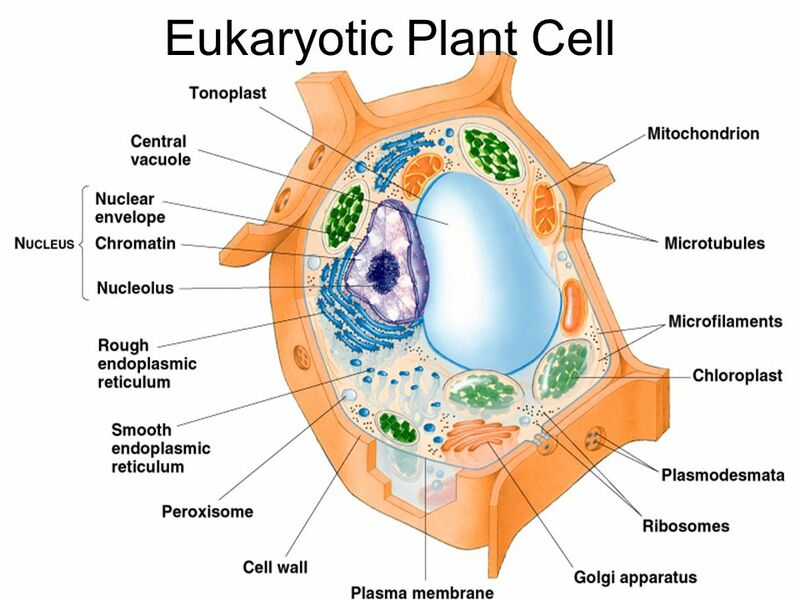 The vacuole moves through the cell, enzymes break down the substance from the inside by entering the vacuole. 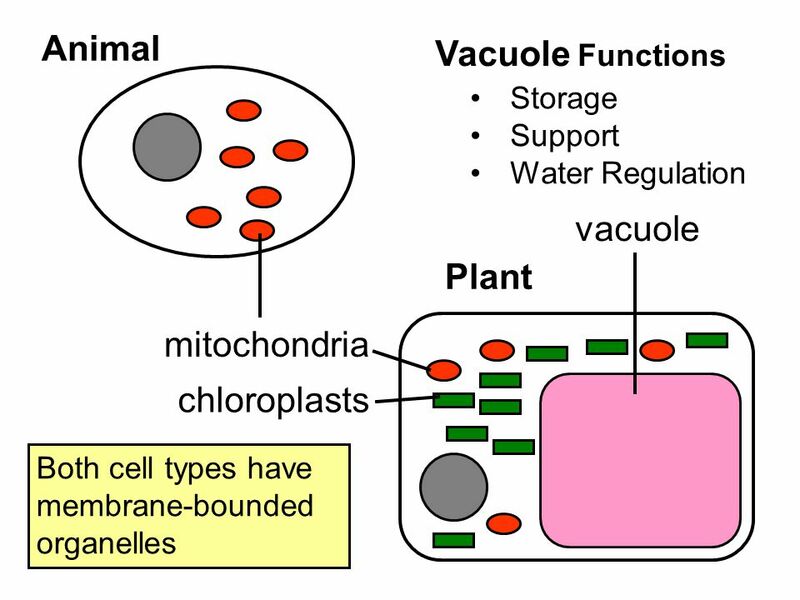 The nutrients are removed from the vacuole into the cell and the cell gets smaller until it gets released from the cell as waste. 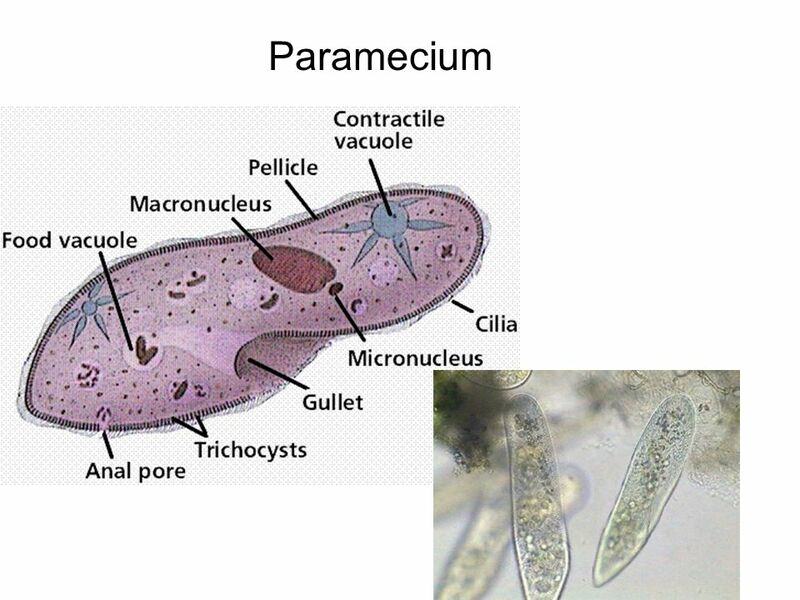 Paramecium are interesting cause they eat micro-organisms and even resort to cannibalism. 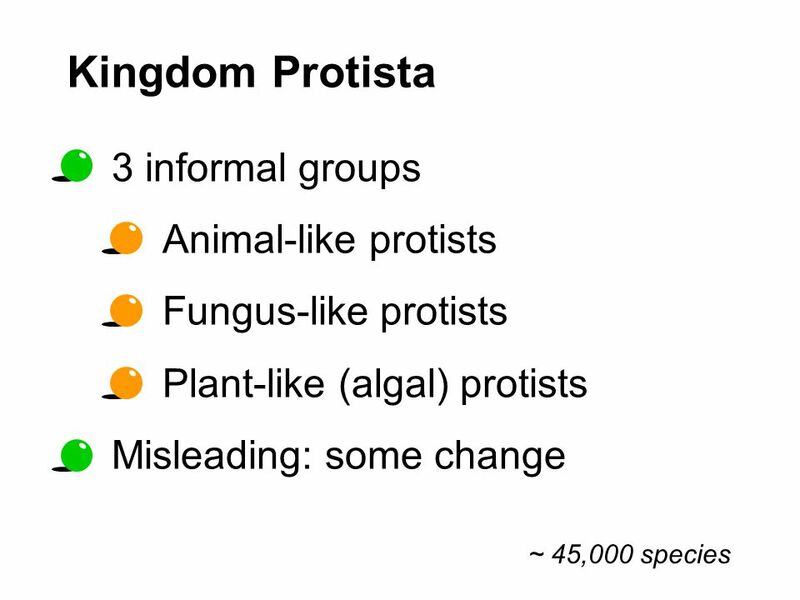 The protist kingdom is very diverse so it is hard to put comparisons on one another without a base. 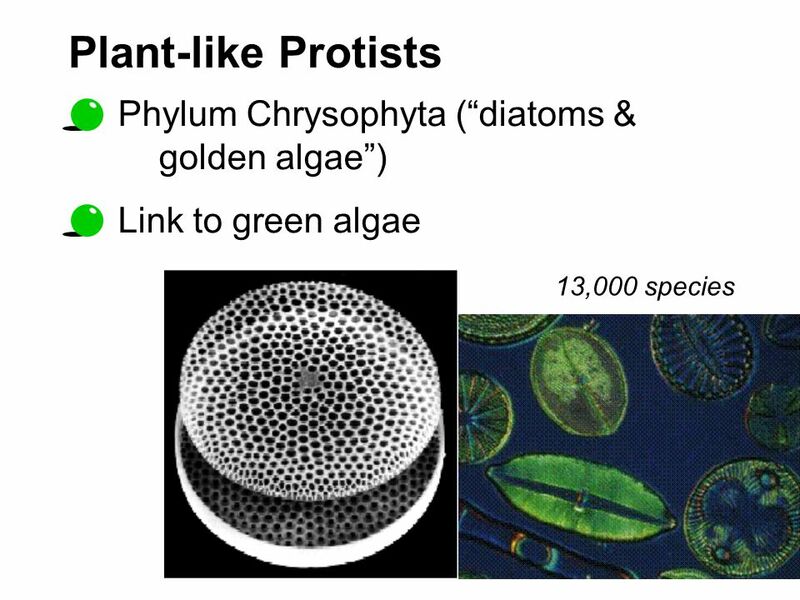 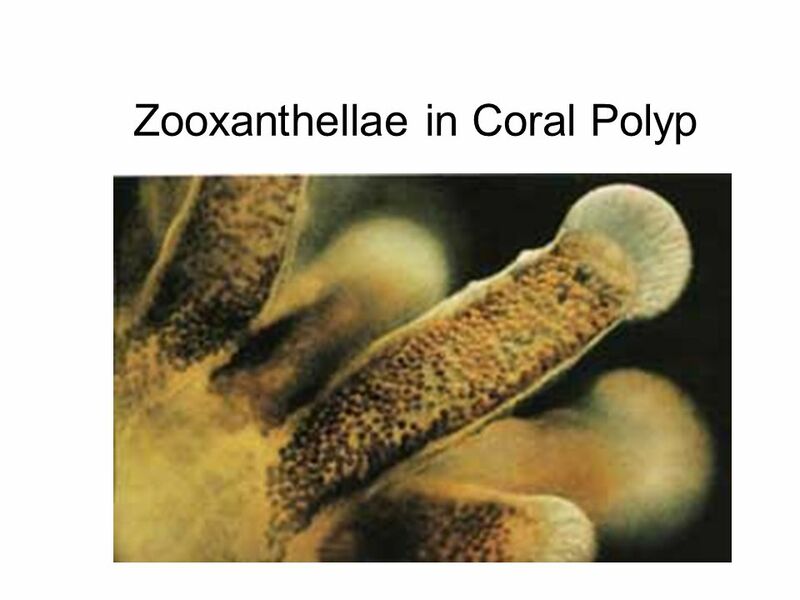 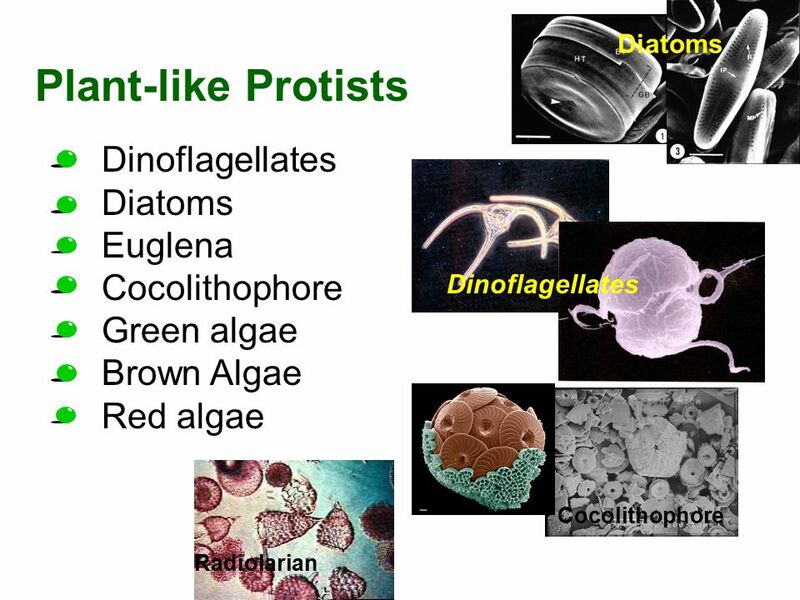 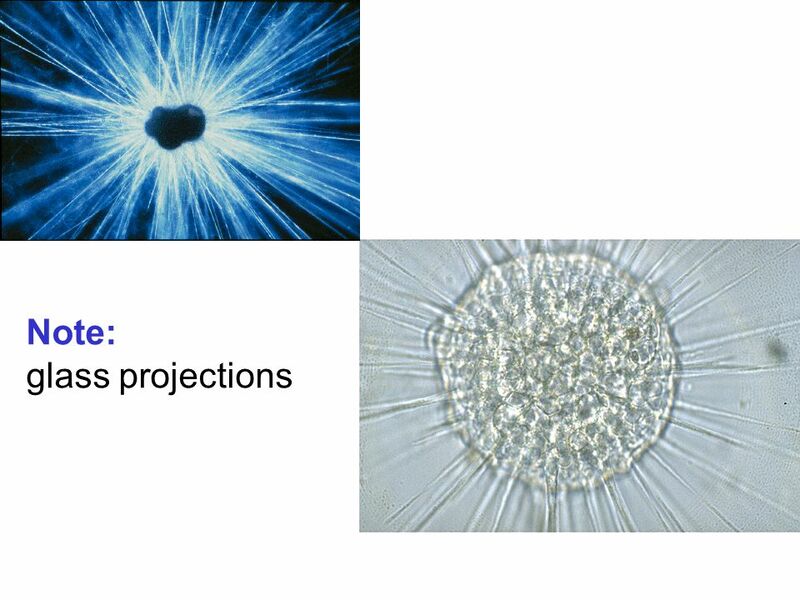 Download ppt "Introduction to Protists"
Protists The Unicellular Eukaryotes. 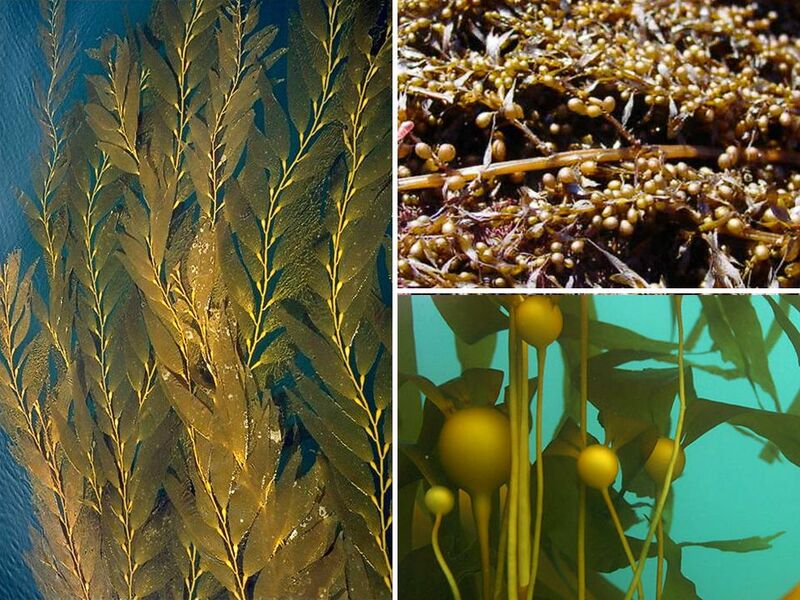 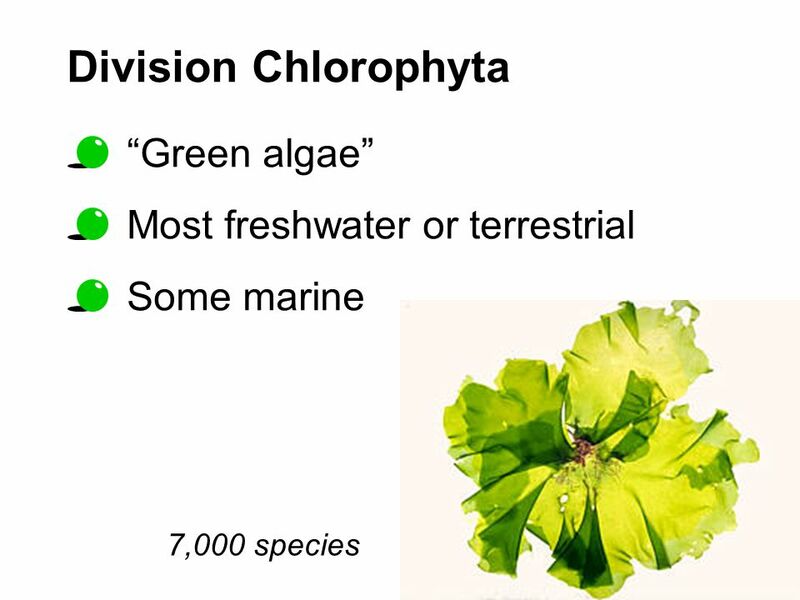 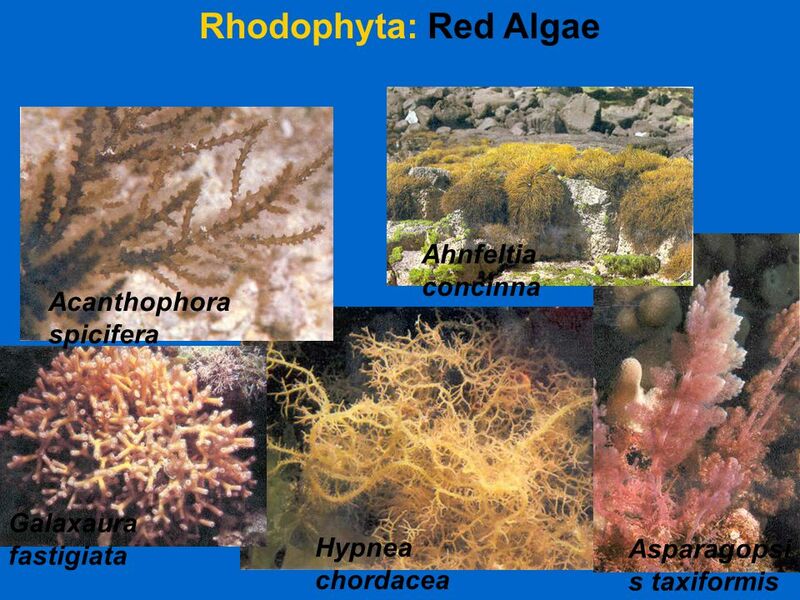 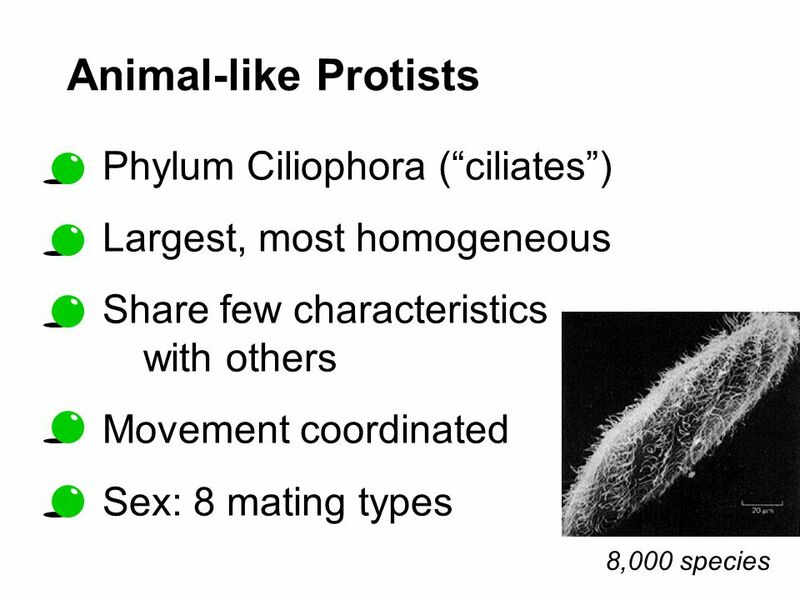 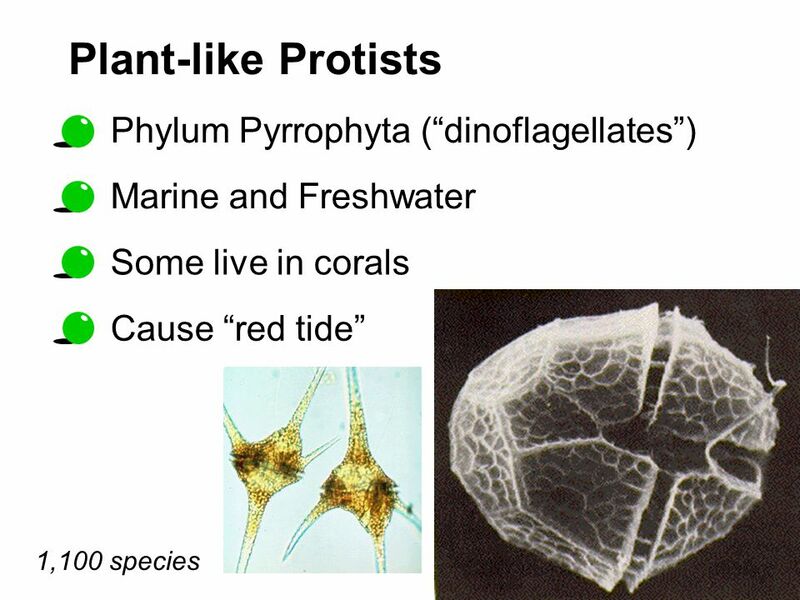 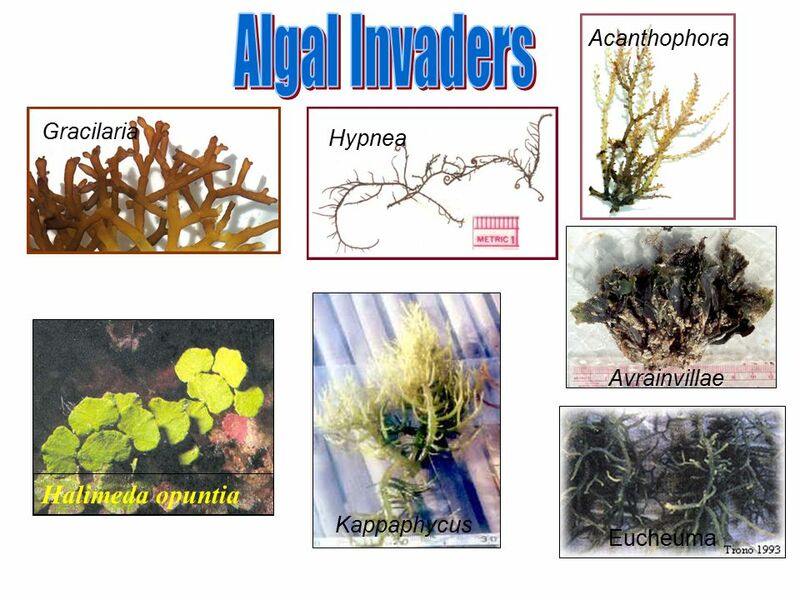 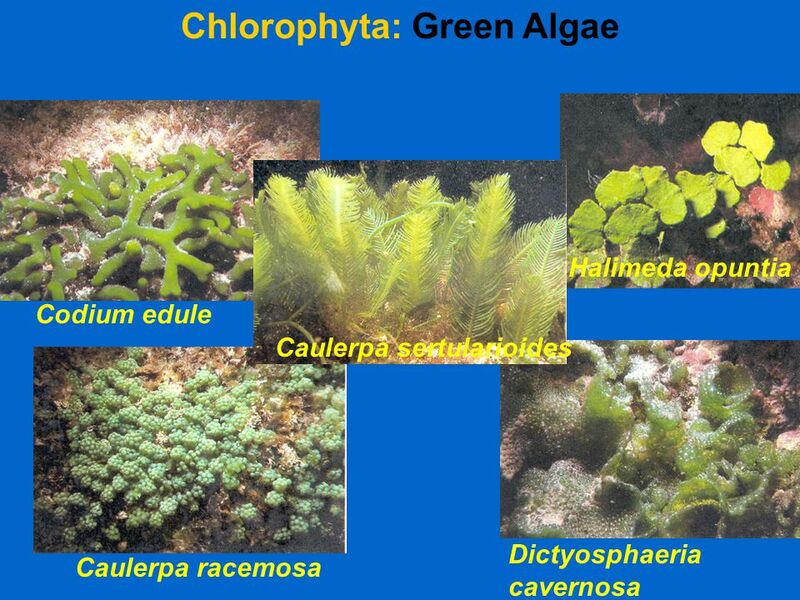 Some Basics:  species  difficult to classify  no “ typical ” protist  most aquatic, some terrestrial. 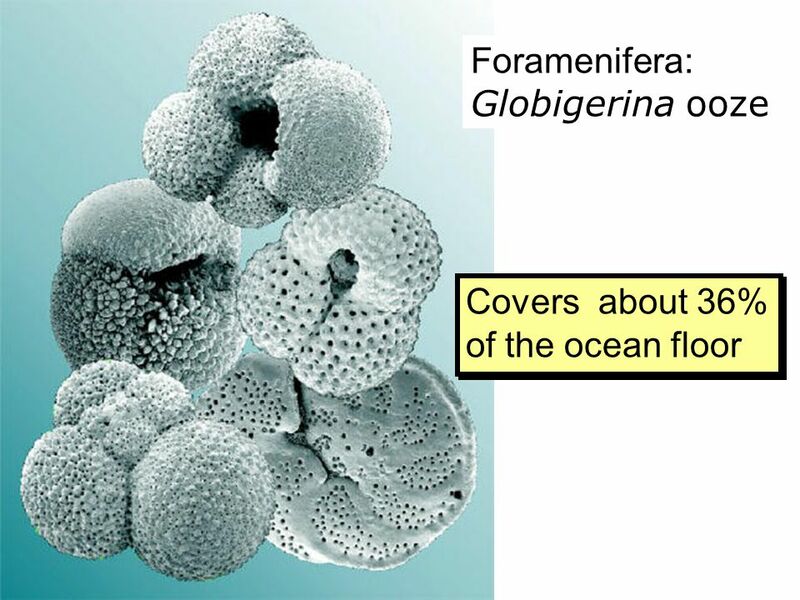 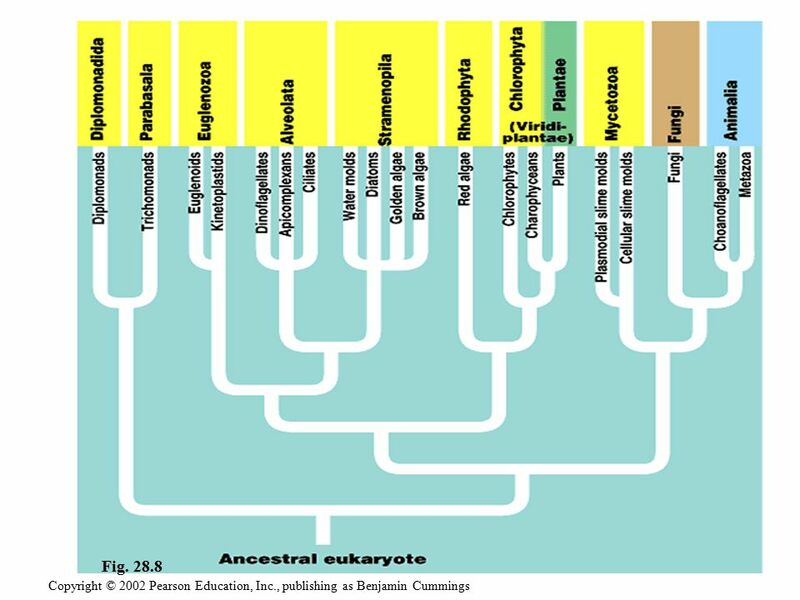 Origins of Eukaryotic Diversity – Protists Diversity. 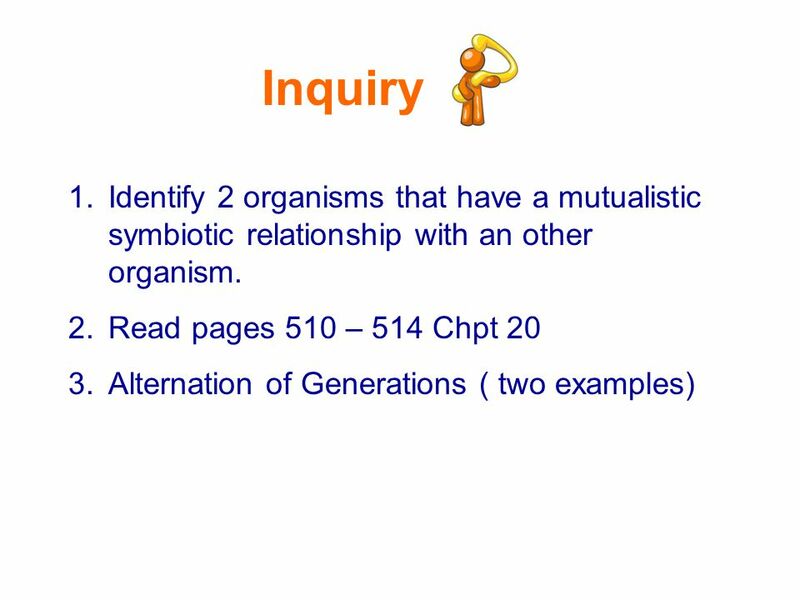 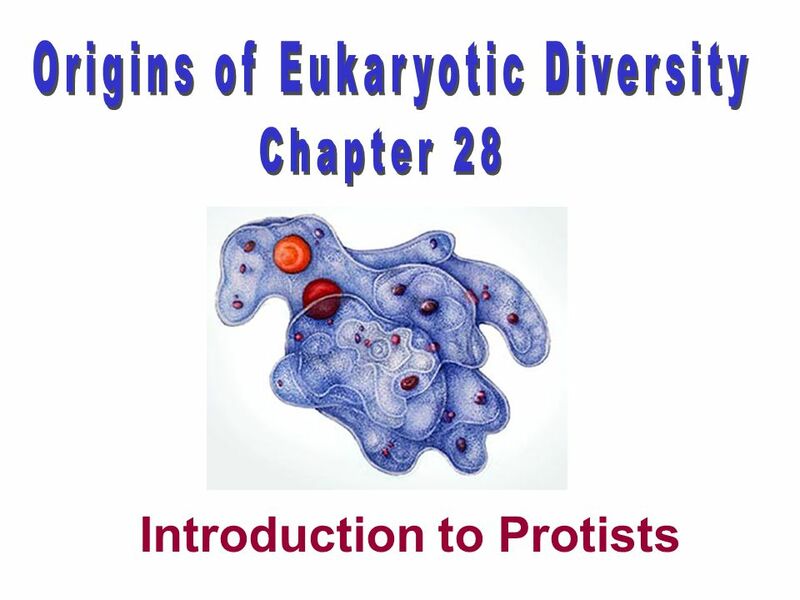 Chapter 28 The Origins of Eukaryotic Diversity. 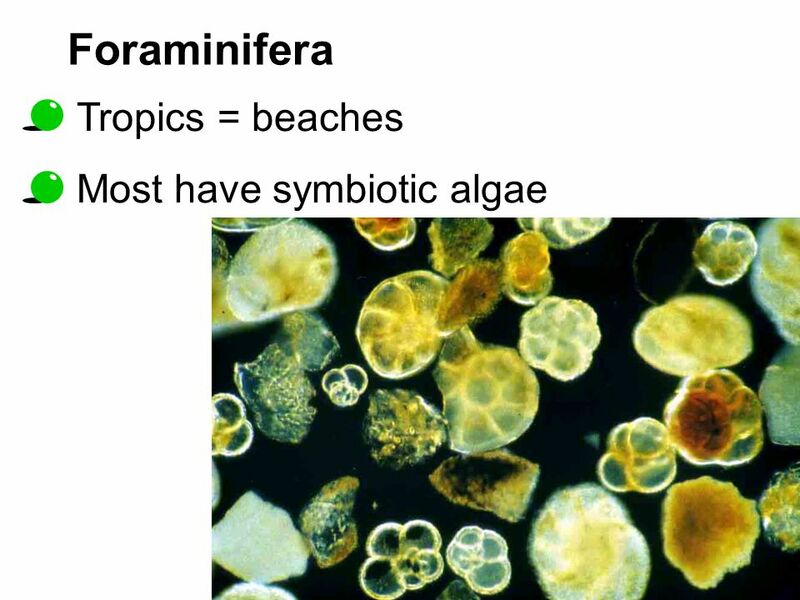 Hawaiian Algae ID. 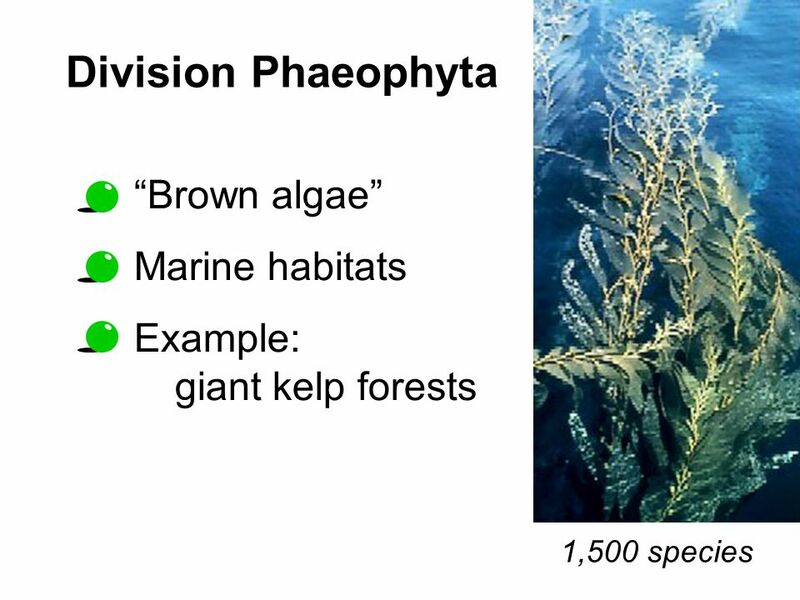 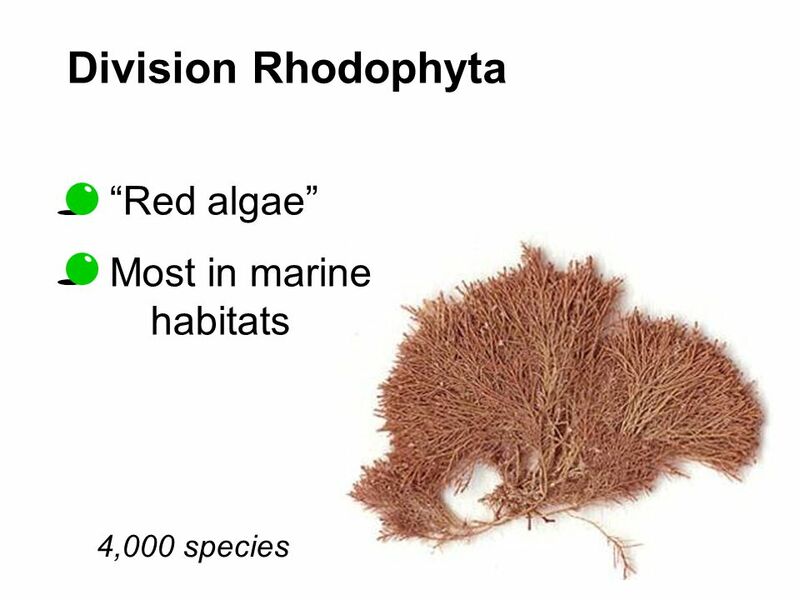 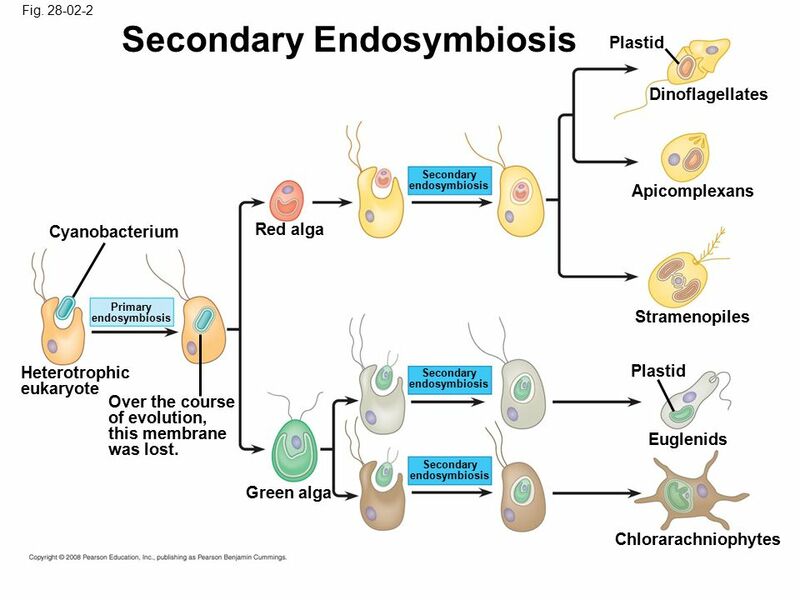 Kingdom Eubacteria Phylum Cyanobacteria (blue-green algae) Kingdom Protista Phylum Chlorophyta (green seaweeds) Phylum Phaeophyta (brown. 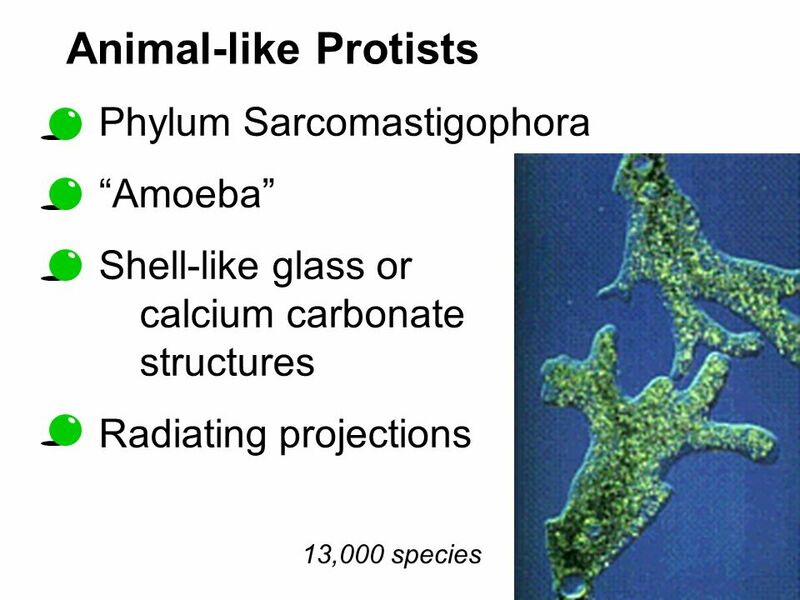 Unit 6--Microbiology Chapter 20 Protists. 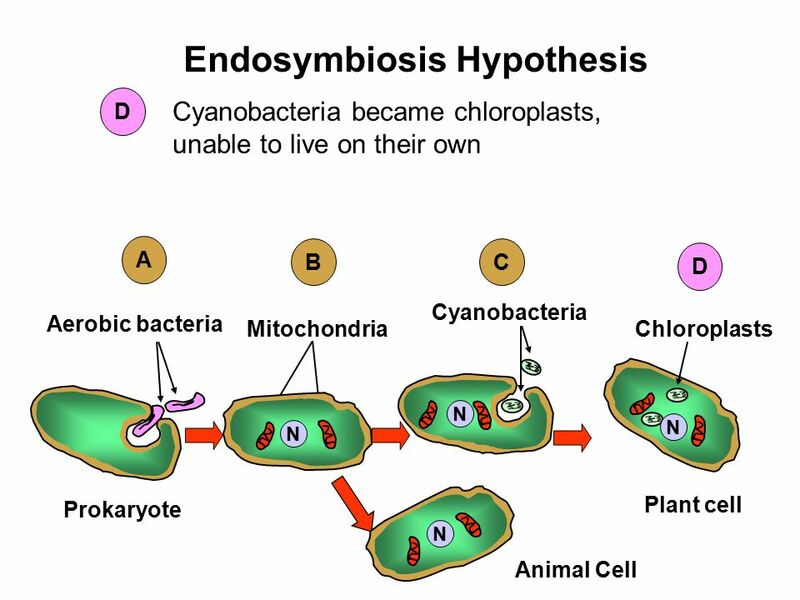 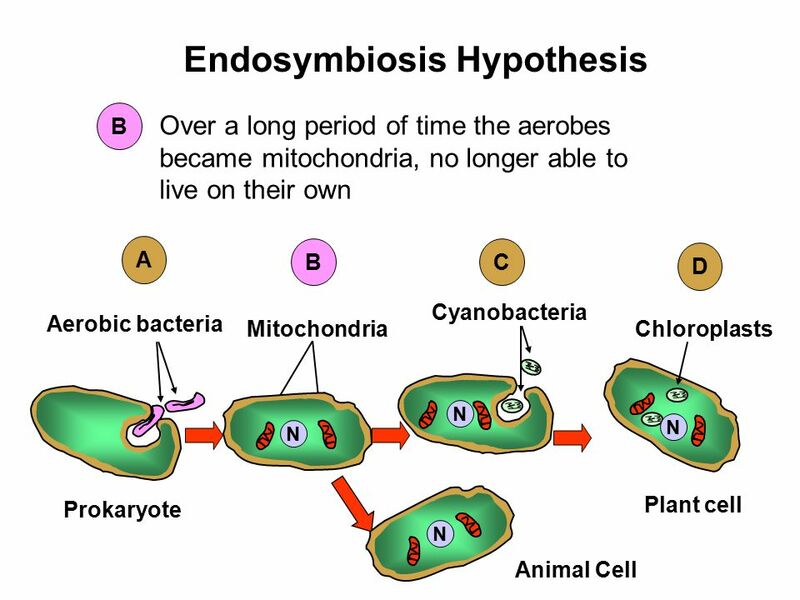 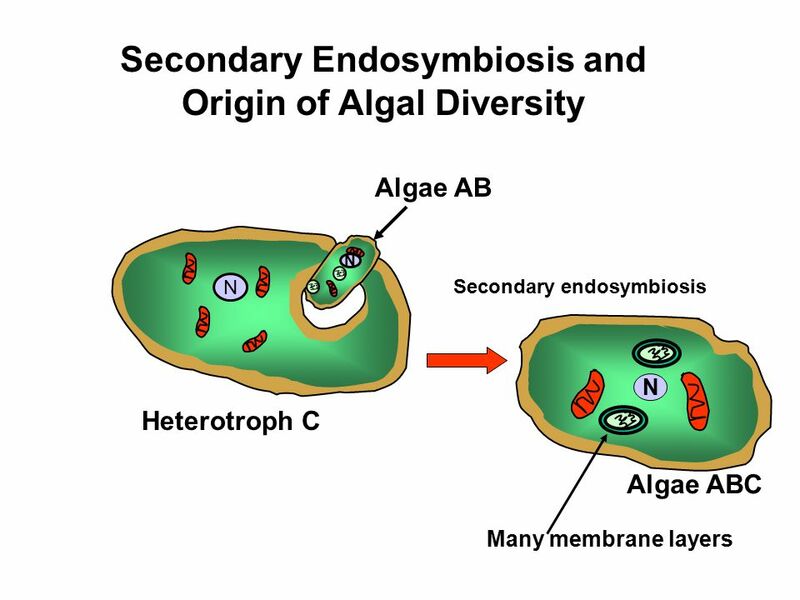 Endosymbiotic theory Heterotrophic bacteria have plasmids (DNA loop) & simple ribosomes in their cytoplasm Mitochondria. 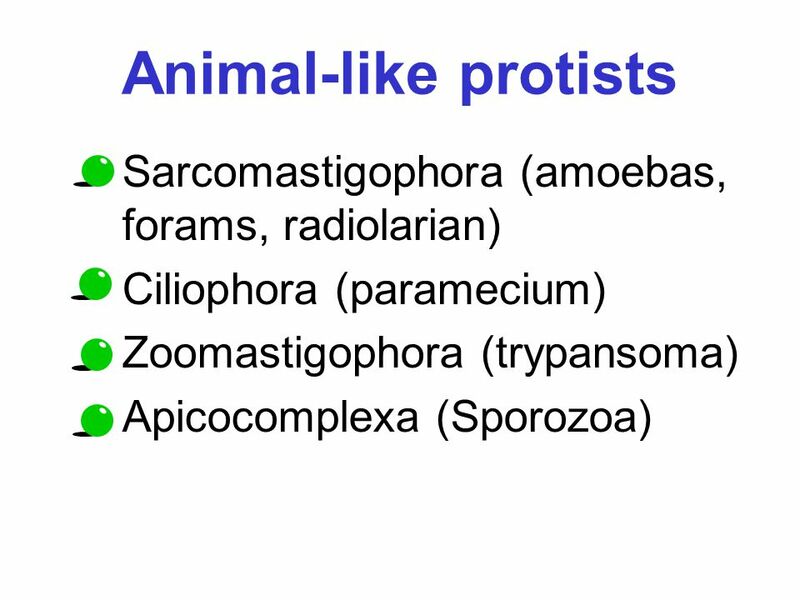 Introduction to Protists. 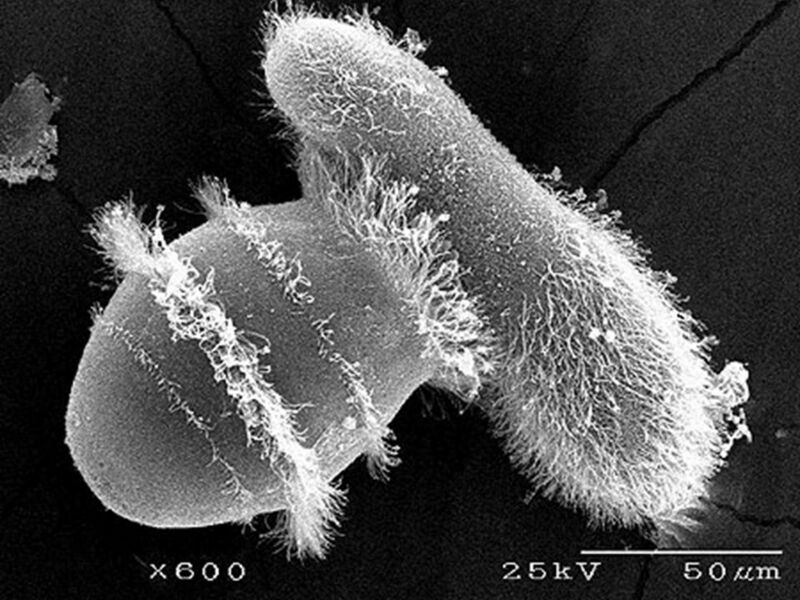 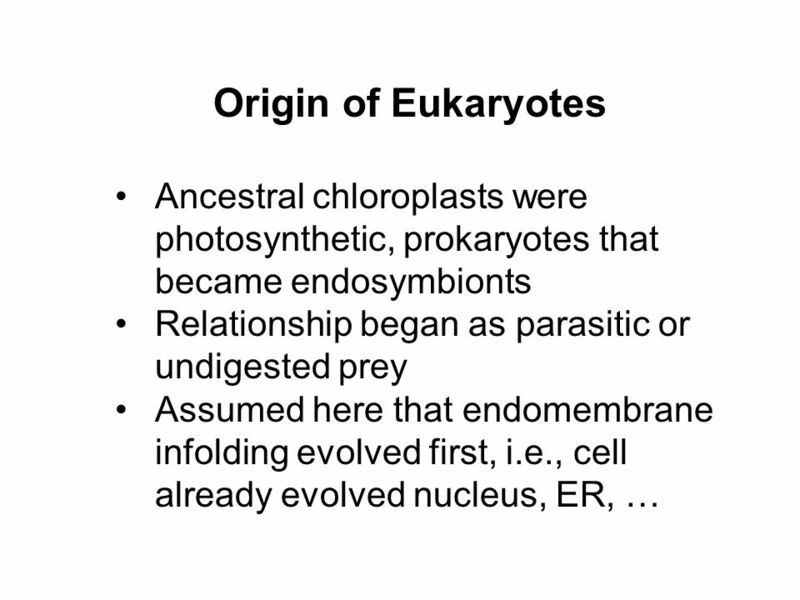 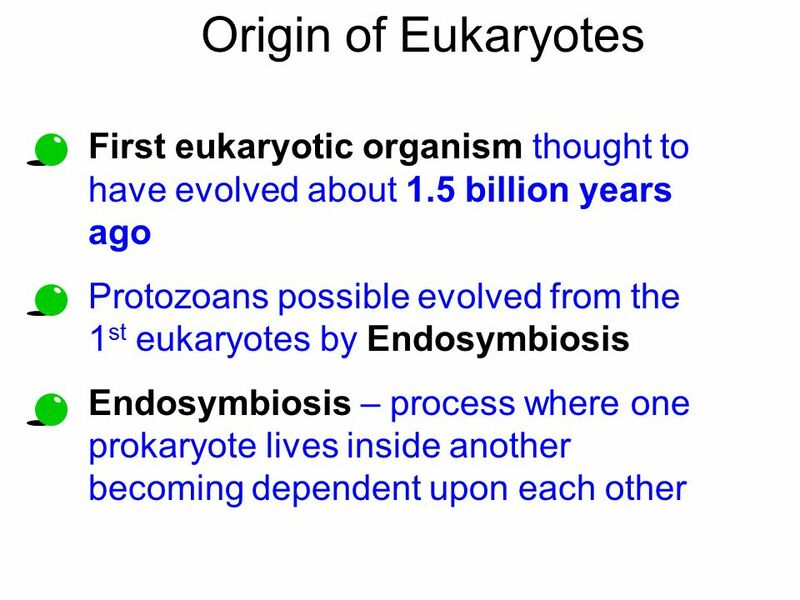 First eukaryotic organism thought to have evolved about 1.5 billion years ago Protozoans possible evolved from the 1 st eukaryotes. 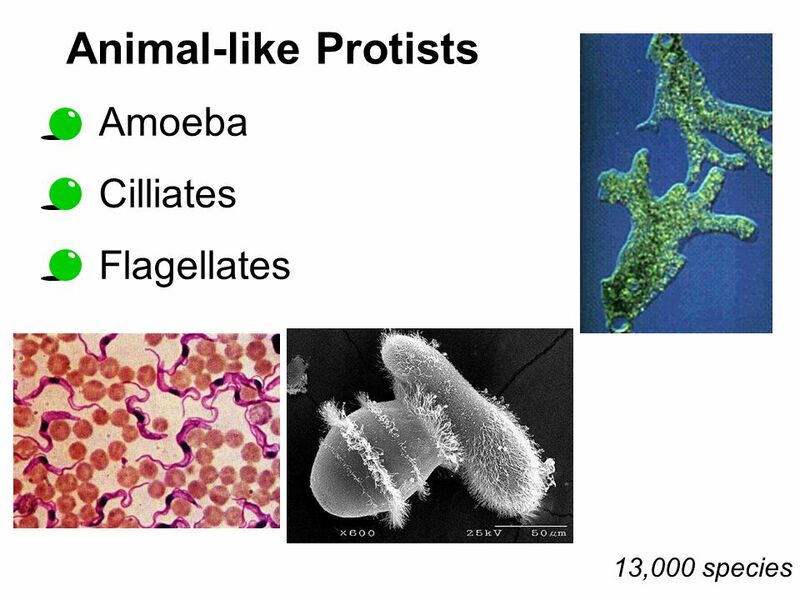 Bacteria & Protists 005. 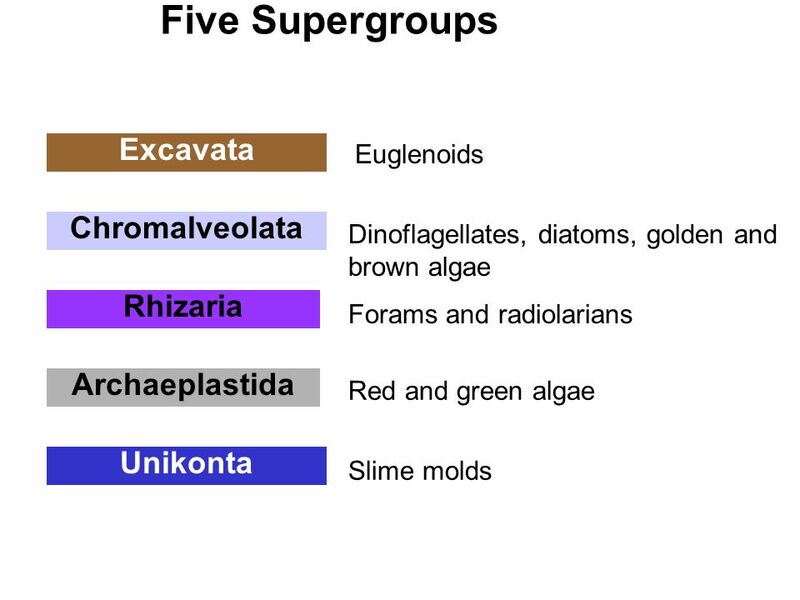 Kingdom Monera Species number low (~17, 000) Changing as we learn more Two Divisions Eubacteria (Bacteria & Cyanobacteria) Archaebacteria. 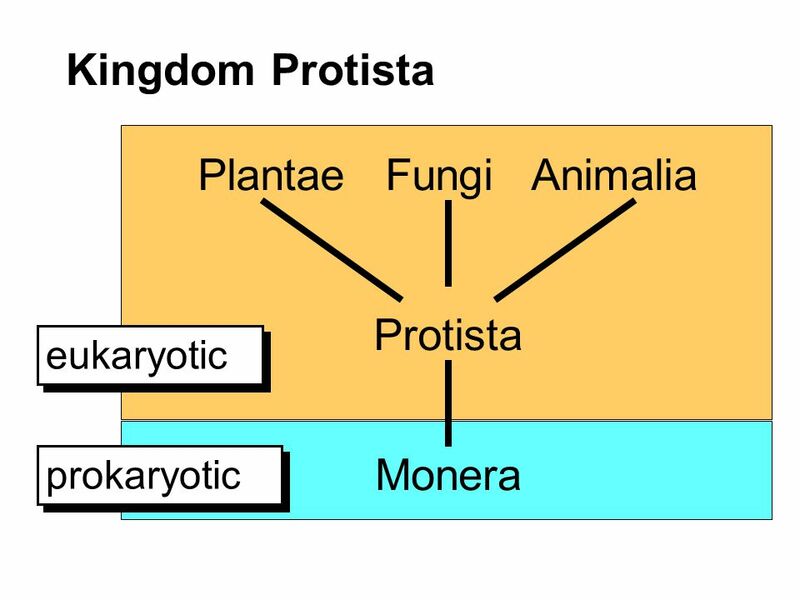 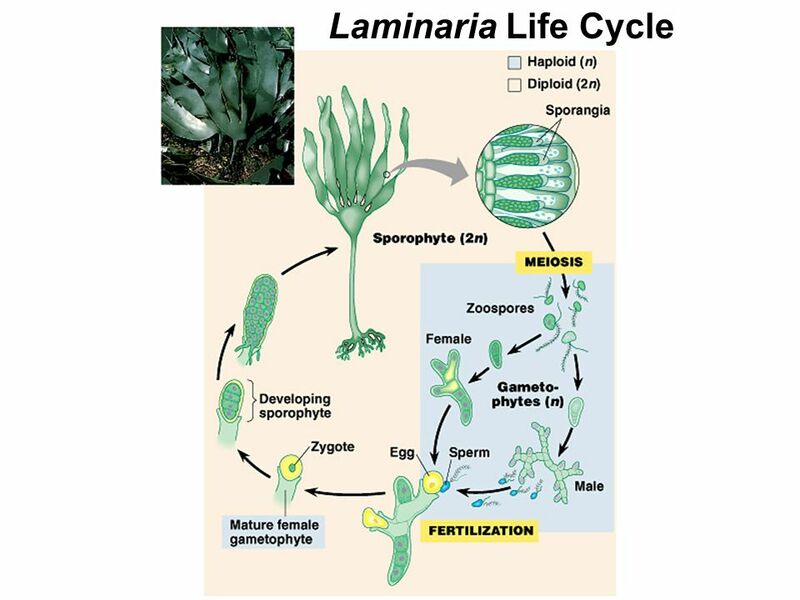 Chapter 5 Marine Prokaryotes, Protists, Fungi and Plants All are primary producers which are capable of using light energy to perform photosynthesis. 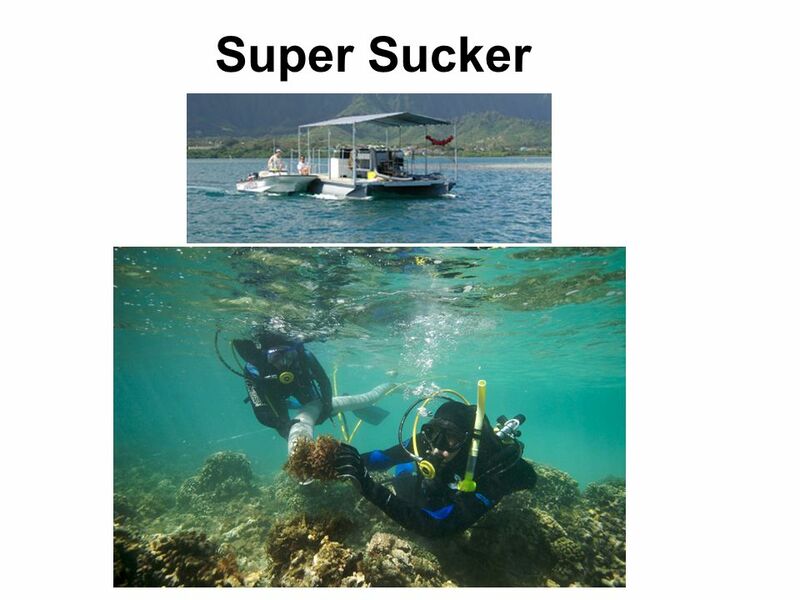 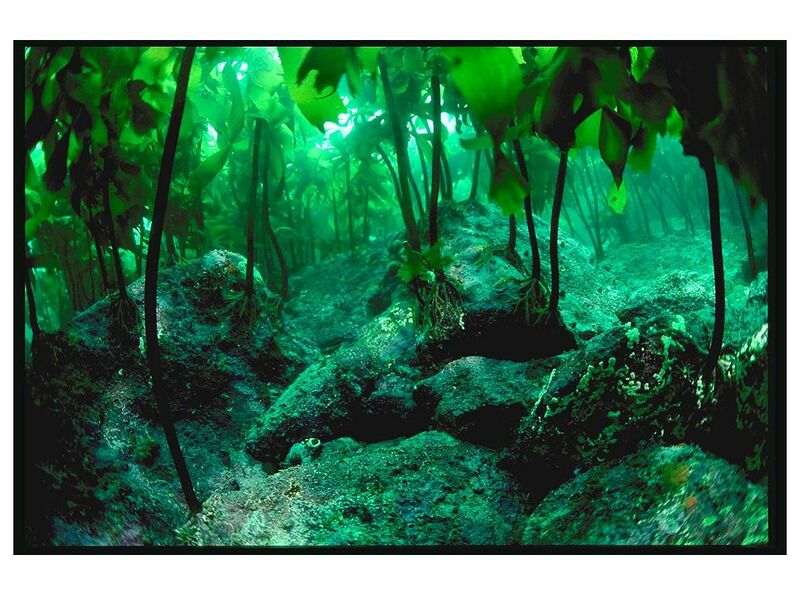 The producers, Many are firmly rooted to the bottom of the sea…. 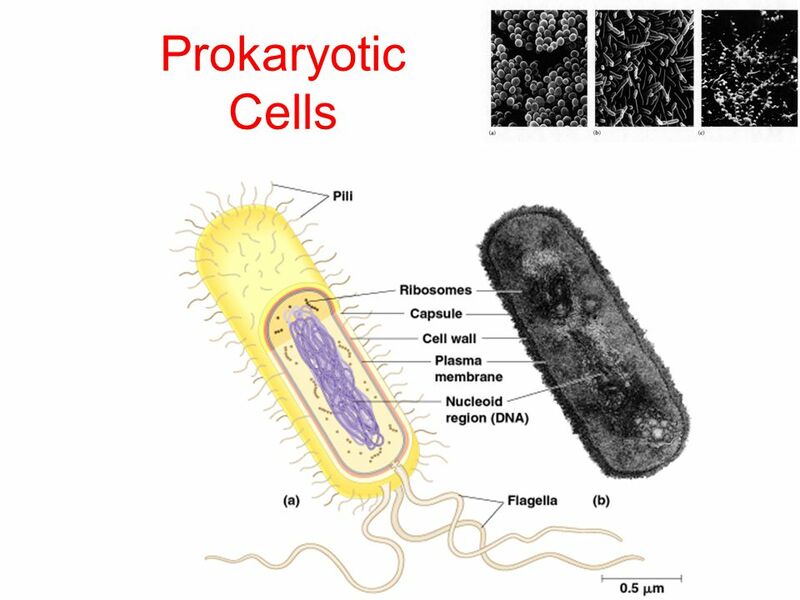 Kingdom Protista Biology 11 S.Dosman. 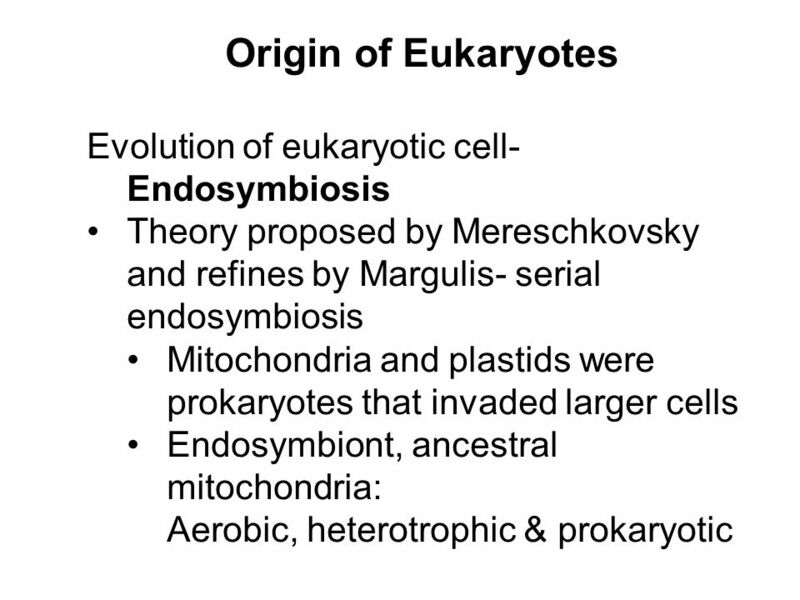 PROTISTS: THE UNICELLULAR EUKARYOTES. 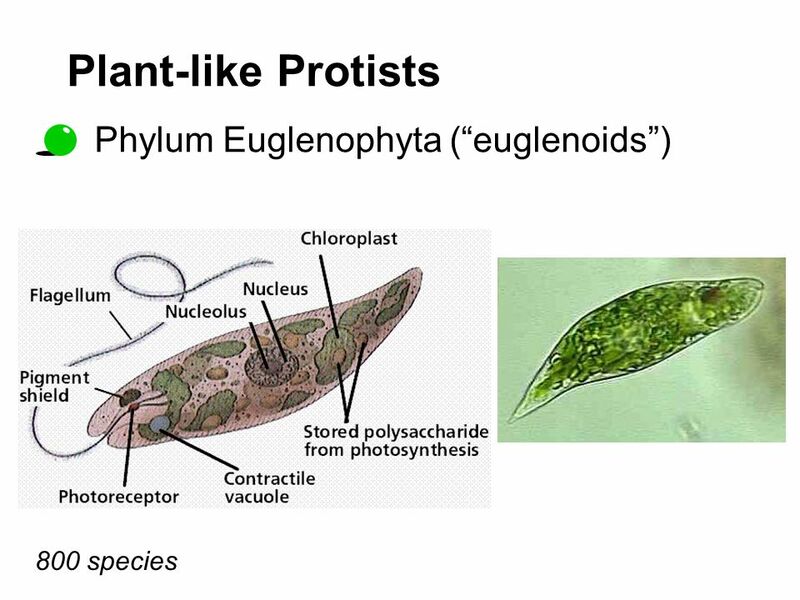 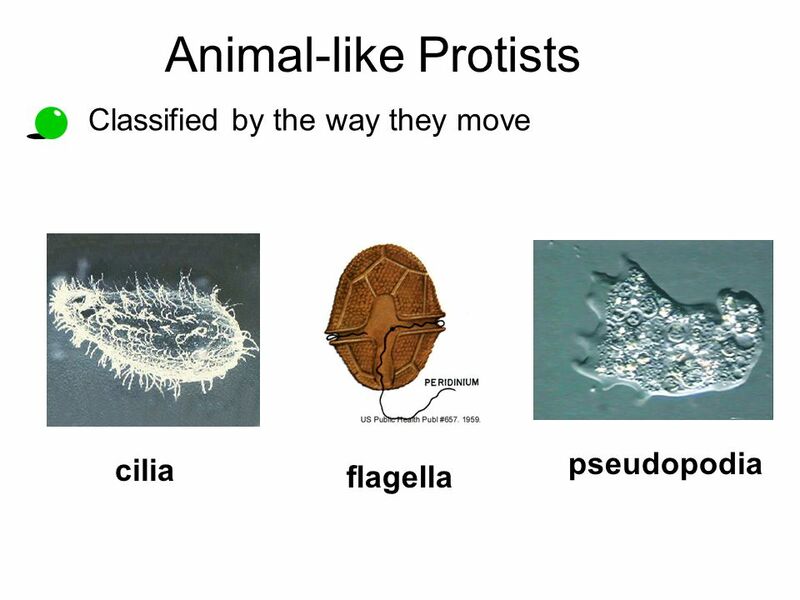 PROTISTS Eukaryotic Usually unicellular Diversely shaped Not a fungus, plant or animal Three types: - Animal-like. 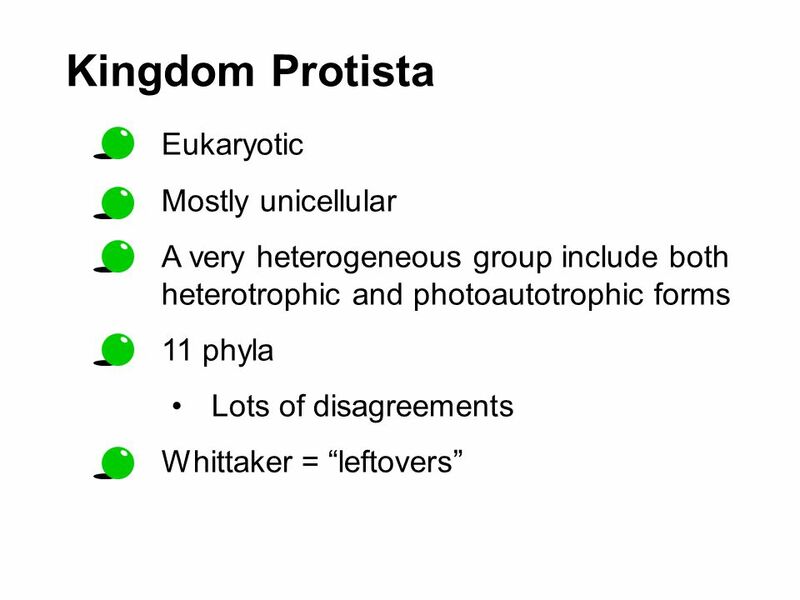 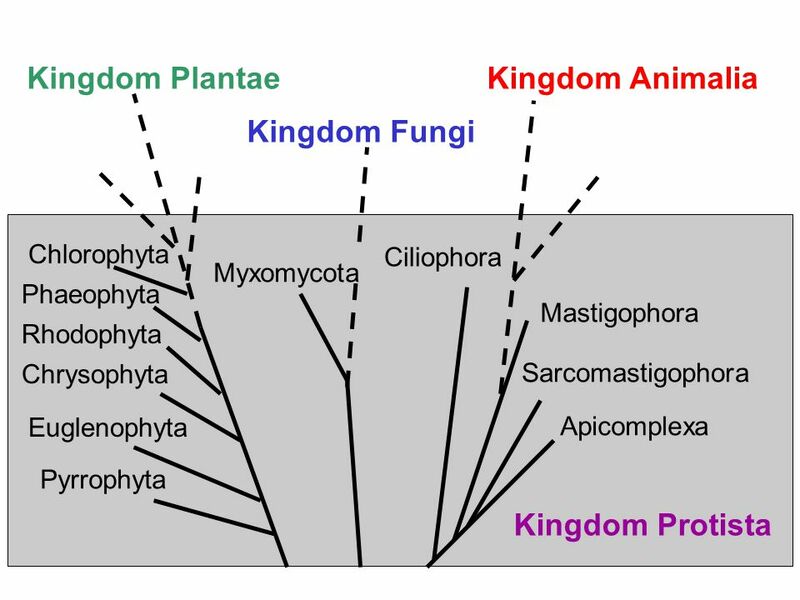 Kingdom Protista Most diverse kingdom.